It is that time of the year when you are shopping a lot for the sake of holiday cheer and for the sake of pure pleasure of self indulgence. It is that time of the year when you are planning little outings in the warm and cool weather of Calcutta to celebrate togetherness. Christmas is out there in the streets. The lights, the circus, the picnics, the drunken evenings. In this part of the world, Christmas is nearer to the hearth. It is about holiday cheer and hot wines. But more importantly, it is about the celebrations at home. I couldn't come to terms with it for a fair eight years. And then I went out and brought a Christmas tree. That was last year. And the young man was a year younger and hence more volatile. The Christmas tree had to be kept beyond his reach, much like the way you celebrate Christmas if you have a pet dog. This year, even before the Christmas tree was in the scene, the demand list had been made! The fact that they are talking about Christmas in their kinderkrippe(pre school) was evident. So, we three went to get our Christmas tree yesterday. And we made a card for Santa which would subsequently include the demand list. And then, yesterday, I came across this video of Israeli soldiers taking Palestinian children and detaining them. The image of Fawzi al-Junaidi being taken by 20 heavily armed Israeli soldiers seems now multiplied beyond counts. The fate of many children crossing the seas while fleeing from war torn zones had taken the media by storm a year or two earlier. I look at my little man singing "Wheels on the bus" and being drawn in to the world of planets, stars and black holes, and a sigh escapes. What gift am I getting some dear ones asked. I should have said I have my blessings and am counting them. I count the blessings that light up my hearth. Merry Christmas and happy holidays friends! The little man is busy learning. Learning how to mimic mamma or baba, learning how to engage in a conversation with the limited ammunition of English words, learning how to sound the difficult consonant sounds of Bengali and, amongst others, learning his ABCs. A for.., B for... continue to echo through his busy mind. With him, Mamma is also learning her ABCs at another level. 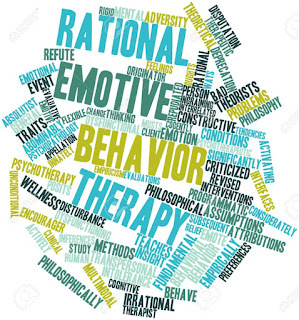 Mamma's ABC s are that of Rational Emotive Behaviour Therapy or REBT. 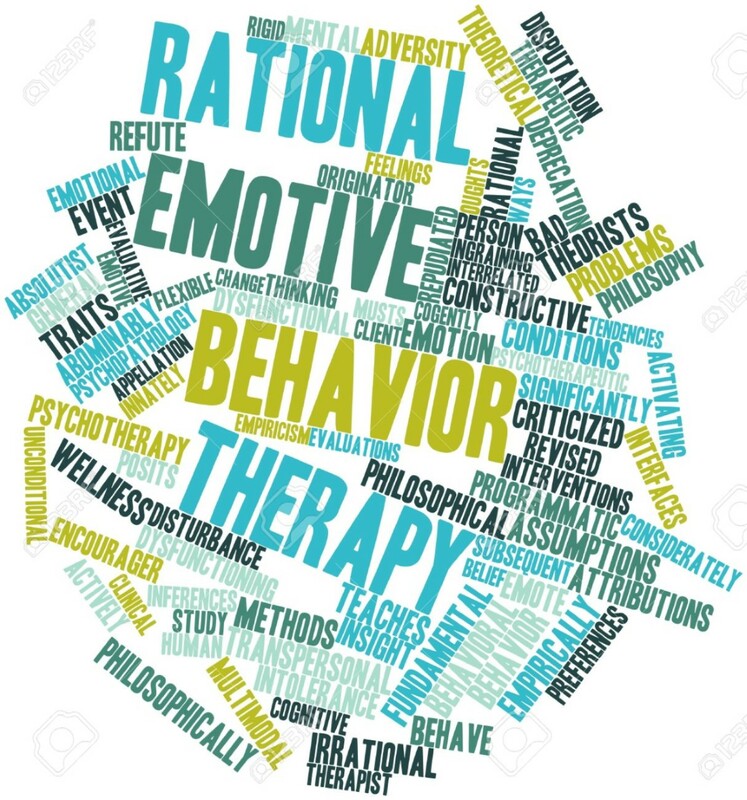 Besides the Freudian therapy that helps in digging into one's subconscious and the unconscious, REBT is an opportunity to find a pattern in the chaos of the mind's life. Let me put forth the ABCs with an anecdote. Several months ago, i was travelling back home from a friend's place with my mom and my little man. Suddenly, the car broke down in the middle of traffic. What followed was a chaos. Finding a fitting mechanic in the late evening hours in the city appeared to be a difficult task. In the mean time, the mind was wandering and found the self to be the cause of the problem at hand. The heart felt that it must be the negativity of the self that has caused the incident of the car trouble. Let's say that this is the activating event A. If i look at it now, i would find B, the irrational belief that the self is the cause of the car trouble and that the self is not good enough at anything. The car broke down due to some mechanical problem, and not because of the negativity settled in the self. The incident does not reflect upon the goodness of the self either. As a result of the activating event, A, what happened that night was that the self reached a breaking down point. There was guilt and tremendous sadness. This consequence is, say, C.
The questioning of the irrational belief, B, is, say, D. How do i question B? i put forth some rational questions- Can a car possibly break down because of a feeling? Does the car bear a living heart that can be affected hence? What proves the lack of worth of the self? 1. the realisation that the car is a mechanical entity and can be subject to mechanical failures. 2. the negativity in the self has no such supernatural powers as to affect the functioning of a car. 3. the worth of the self can't be measured by the functioning of a car, or a lack thereof. It is a theoretical exercise undoubtedly. The number of times i can do it when am in the moment of the activating event, is still insignificant. But what i try to remember more is that it is an exercise that can be mastered with practice. My little man struggles with his M and N , while i struggle with my Mind. We both are at the learning phase of bricks of growth. 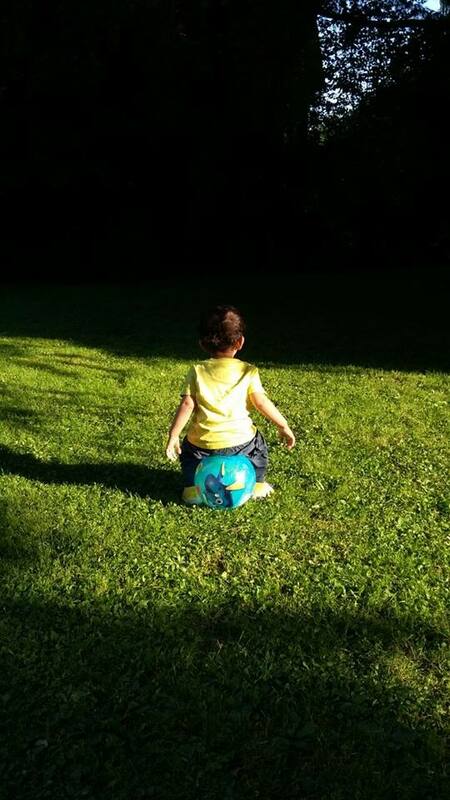 Two and up is the ripe old age of learning the bio mechanisms of the little body, studies and surveys suggest. And mothers believe them as they do believe that the sun is standing still at the centre of the solar system. Trials and tribulations, accidents outside the pot and absolute defiance make the potpourri of lives of moms and their toddlers at this stage. In this part of the world, none of it matters. While there are semi outrages against the diaper, there is an ambivalence of acceptance of facts and figuratives. The cold Austrian winter is not the time to attempt potty and pee training. This mom is neither a freak nor a supermom to try it either. This post is thus not about the little man's trying times, it is about the mother's. Once you have a baby, notorious stories about moms skipping showers for days, till before she screams for help abounds. Forget showers, i say. What about pee-breaks and potty-breaks? This little man would invariably wake up the moment the mom used to step out of the bed for a pee-break. After a couple of days, the crying would become a natural alarm for the grandparents on the above floor. Things got only minuscule better as the days advanced. The little man began to crawl, then toddle and finally walk to the closed bathroom door and wail inconsolably, even when the father was present right beside him. The mom often had an ominous feeling of imminent child protection unit knocking at the door. Bless the poop it never happened. That brings us to the unholy aspect of what i call the privilege of potty. The wailing was no different in this case. The difficulty was the fact of time that it needed. There is no elegant way of saying this but that, the peace of potty as essayed by Gopal bhanr* in his stories, is lost once you become a mother. The realisation that the bodily mechanisms of a mother have to be moulded to the rhythms of the baby's life, comes with much practice and a sense of nirvana.Training your body to answer to nature's call only if it suits the baby's schedule is a monumental achievement for which knighthood may as well be bestowed. Next time some dork passes you a wretched line, answer back, "How long can you hold back your potty?" I believe your line will score an under the belt point unquestionably. Oh, and by the way, the sun is not really static. It goes around the milky way galaxy every 230 million years. *Gopal bhnar was asked by the King of Krishnanagar, that, how does he feel at the birth of the prince. Gopal replied gleefully that the joy he felt is like the one he feels once his bowels are clear. The King took offence at Gopal's choice of simile and was very angry. Shortly thereafter, one day the King and Gopal were travelling by boat when the King felt the nature's call. The boat was shored and the King could have his bowels cleared. Then, Gopal asked the King, how do you feel now? The King replied with satisfaction that he felt very happy. Gopal then brought up the topic of simile he used at the news of the prince's birth, and the King accepted the aptness of the simile. When the little man was wee bit little than now, he had his first book. The books of small poems or chhora were read to him by his grandparents. But Bagher Golpo (The Tales of the Tiger) by Upendrakishore Ray Chowdhury was the first book that he 'read' when he could sit by himself. Every night, before snuggling to sleep, it had become a ritual of sorts. Observing the pictures with the same care with which the pages were torn, he valued his reading time immensely. When he had more than one book to attend to, he would pick up his favourite from the bunch to begin the reading session. The Tales of the Tiger was followed by a beautiful book gifted by one of his paternal grandma's friend. It was a Bengali alphabet book with rhyming verses and the accompanying pictures were etchings done by none other than Satyajit Roy. Due to the intense 'reading', none of the original books exist except in shreds. It took a lot of effort to get hold of the Bengali alphabet book's second copy. There possible was no great need of second copies of each of the two aforementioned books, since, many more books would follow in quick succession. But there was one need that was beyond the little man and his existence. Those two books are elements of memory. Now, when i bring forth these books to read with the little man, he doesn't. i believe, remember his early reading times. What these two books are worth is the love for books that seems to show through him. He has his new favourite book - the 'baby book', he calls it. It is Smile baby smile. It has lived through the phase of reading by tearing pages. He knows the book by heart and actually reads along with either me or his dad. 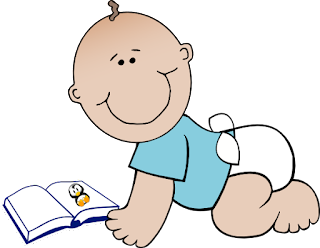 What introduction of books to babies do, i am yet to witness in the forthcoming years. For starts, they learn early not to rip off pages from mom's favourite books lined up in the bookshelf. But what about scribbling? Well, that's another story for another day. The one who ushered in motherhood in me turned two yesterday. The difficult days had turned to weeks, weeks to months and months to years. In the last one year, the little man had grown from one with unstable steps to roadrunner cruiser. He had moved on from surviving only on milk to approximated human eating behaviour. He has made a neat choice of his favourite toy- wheels. He loves to read books at bedtimes. He has developed a knack for giving speeches in an incomprehensible language to humans. And yesterday, i noticed he has also the devilish glee if he can pull a prank on another of his age. i used to read a lot of mommy blogs that speak a lot about getting a habit out of a child at an early age. Self-soothing, no milk after bedtime and busy-bags are some of the issues that they often focus on. Frankly, i am a bohemian by spirit and hence categorically organising each or any of the above-mentioned thing has been a difficult task. My little man still drinks milk while sleeping. He still needs someone to rock him to sleep. On his bad days, he still clings on to me and is cranky. He still is a toddler who needs activities, even-if they are not out of prepared busy bags. And i realise its okay if he is not like the others. He is pretty much like himself. He is visciously suspicious of new things offered to him. At the same time, he seems to be happy to meet people on the streets any day, tugging at their clothes, or screaming loudly if the the other person hasn't registered a wave of his hand. He calls all his relations by the first alphabetical sound, making him aware of almost all the byanjonbarna there are in the Bengali script. Moni becomes Mo, Shonadida becomes, Sh(n)o, Thamma becomes Tha, Ponaidida becomes P(n)o. In the midst of all his idiosyncrasy, he teaches me some important lessons of life. He is angry only till the time his reason of anger is unattended. He doesn't carry its baggage. He is always looking for ways to be busy. He is calm at times focused on his favourite wheel. He is forever in joy. These are lessons that spiritual guides often impart. These are lessons that a little man imparts to me. Happy birthday little man. Happy birthday to me. As i stood there, waving at the taxi that was leaving for the airport with my partner, i did not cry. It was only ten days ago that the magical moment had happened. i wanted to be strong. i wanted to be calm. i wanted to be the best that i can be for my little man. The pain of separation from your best friend, mingled with the immense pressure of handling your baby right, created a chaos in the mind that went unnoticed to the conscious self. My parents were there to support me through that phase and support they did. Yet, the photographic joy that you imagine would follow the birth of your child is far from reality. From the bloody mess of the hospital, you come home to the truth that life will never be the same again. The peaceful shower times, the relaxing meal times were things of the past. Late at night when you go for a pee break, the little man magically wakes up and wails at the top of his voice. You learn to eat while cradling the baby to sleep. You learn to shower in minimal time. You learn that rest is the ability to take a deep breath. But you often wonder, in the dead of the night, in corners of the room, in your solitude, on the sly, whether you have taken on more than you can handle. You think about it and you shun yourself to silence. What a silly thought is that! How can a mother even think like it! The more such thoughts crowd the mind, the more you lean away from thinking to extroverted exaggerated actions of affections, celebrations and responsibilities. And still everything can't be done right. When anything goes amiss, the soul is tortured to believe that the self is at fault. In the midst of it all, the little man learns to hold on to his bottle with fist-ed hands, wants to crawl, falls off from the bed, has potty issues, learns to run with his walker. So many life events happen that the soul wants to forget it has any pain. But the tears welled up within. They were tears of joy as much as they were tears of that prickly pain that is of no use. It was six months after post natal depression set in, i think, that i revealed to my family the fact that i was in depression. Time heals, people say. Sometimes it does not. And you need help. i lay on the table like frog about to be dissected. Somewhere else Kolkata Knight Riders were having a match. Somewhere else the festival of lights was being celebrated with fireworks -banned and otherwise. Somewhere else the goddess of wealth (Goddess Lakshmi) and the goddess of misfortune (Goddess of A-Lashmi) were appeased a while ago. Somewhere else the worship of the Goddess Kali had begun. And in that moment, i lay like a frog to be dissected. A little while ago, he had missed a heart beat. Missing a heart-beat had never sounded as ominous as it did at that moment. It had to be a Cesarean. Cutting through flesh, through layers of bloody mess, he would emerge. Our little man. The nauseous feel of the blood and the mess remained even though i couldn't feel a thing. i remembered Kafka's The Metamorphosis. Surely i wasn't metamorphing into anything. The metamorphosis had happened ten month and ten days ago. The walk had gradually become strange, the breath had become heavier, the taste for food had changed every day, the washroom had become farther and farther. That was change. That what was happening there, in the middle of the night, as my partner paced impatiently and my parents waited with camouflaged anxiety, wasn't really change. 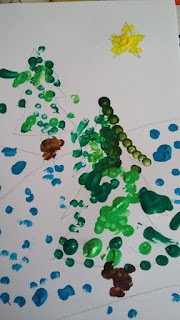 The little man, wrapped in clean white sheets, with a white cap on his little head, fish-mouthed me and blew bubbles. His eyes were crystal black. The nurse who held him said hurriedly, "Contact, contact. Cheek to cheek." i barely felt his cheek to mine. It was implausible almost. This living being had grown in me, listening to light and classical music. This living being had grown in me, listening to Sartre and to retellings of the Ramayana. This living being had moved, nudged, kicked, gasped in me. This living being was the magic we were waiting for. i called to the nurses to give him to me. They said, they will give him in time. i took the pain killers for i was in no mood for pain. Three long hours passed before we met properly. He. so little, in my arms, seemed to be the most precious thing i had ever held. Dishevelled hair, last night's clothes didn't matter. We clicked our first family picture as the morning was setting in. The romance of motherhood hit the wall when i wasn't producing enough milk to satisfy my little man's hunger. My partner came rushing from home, (he had reached home a little while ago). He tried to reason with me. The second-time mother in the bed beside mine consoled me as well. It's normal they said. So did the nurses. But i couldn't get over the first guilt i ever felt for my little man. To me the equation was simple. i was pregnant, a baby would be born, i would feed and clothe him. For individuals like me, taking on guilt for others' actions or things beyond my control is a problem in my social behaviour. But i was in no state of mind to analyse it all. At that point of time, the only thing that occupied my mind was that i, the mother, was being unable to feed my child. i held myself guilty, no matter what everyone said. i understand now that i carried this guilt for quite a few months after that. This was the beginning of post-natal depression i think. This mental illness is again an issue that is mostly left unaddressed in our society. While with the birth of the baby, the baby's health and wellness becomes naturally a priority, the concern for the health of the mother is limited to her physical well-being. In the weeks and months that followed, i would hold on to my little man, may be feeding him, may be rocking him to sleep, and still feel the tears rolling down my eyes. A sharp pain, as if something was amiss, ran through the veins. I was ashamed to share this with anyone. How could i, the mother of such a beautiful child, feel anything but happiness? My world had changed for sure. It had evolved into something that i was still grappling with.